The course is designed to impart knowledge and awareness of hazards at height, and set-up and work on appropriate fall arrest systems do improve work and safety within the construction industry. It has been noted from Industry feedback following the course, that some individuals have improved their safety standards within their working environment. They also have noticed that their work-rate has improved due to a combination of knowledge of their fall arrest system, and a greater trust in their equipment. When an employee trusts their equipment, they naturally can concentrate more on the work at hand. 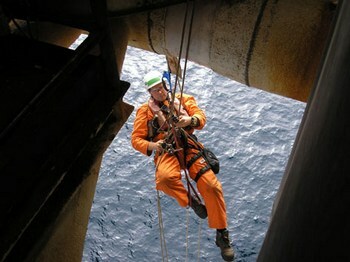 Equipment associated with safely working at heights in many industry situations. Total NZQA unit standard credits: 10 credits at level 3. Trainee’s must be free from any circulation issues as they will be suspended in a harness, circulation problems greatly decreases the time that a person can be suspended before serious injury will occur. Enquire to find out! + cost of NZQA credit reporting (if required). Using this form, or call us during business hours for more info: (07) 575 2185.